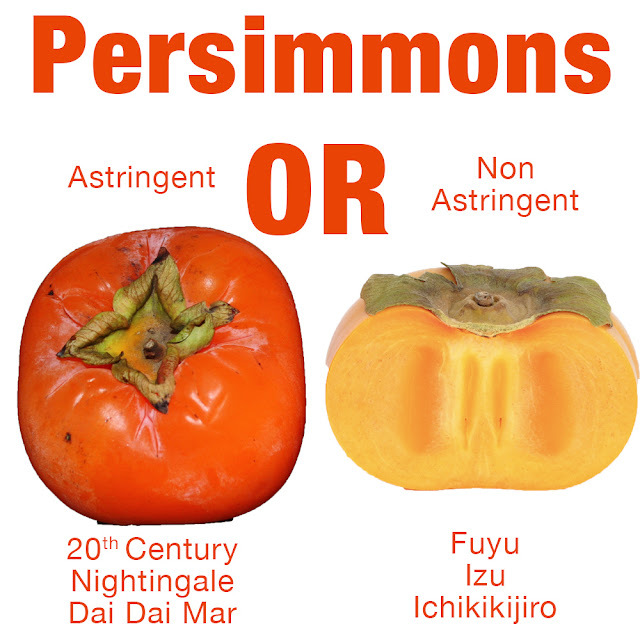 Persimmon Fruit Trees - Choose Astringent or Non Astringent? Can you write in the comments "Astringent" or "Non Astringent" so we can see which ones you like best? If i had to choose I enjoy Astringent Persimmons. The Fruit must be perfectly ripe and almost like Jelly before you can eat it. If you get the timing wrong you will be spitting it out for 1 minute and the sandpaper taste lingers for 5 minutes. But when they are perfectly ripe they are amazing, will stop you from thinking about everything else and just enjoy the moment. Granted eating them is impractical they can fall apart and are sticky and gooey and there is only a very small window where you can eat them but the taste is amazing. Transporting them when they are ready to eat this can be difficult. 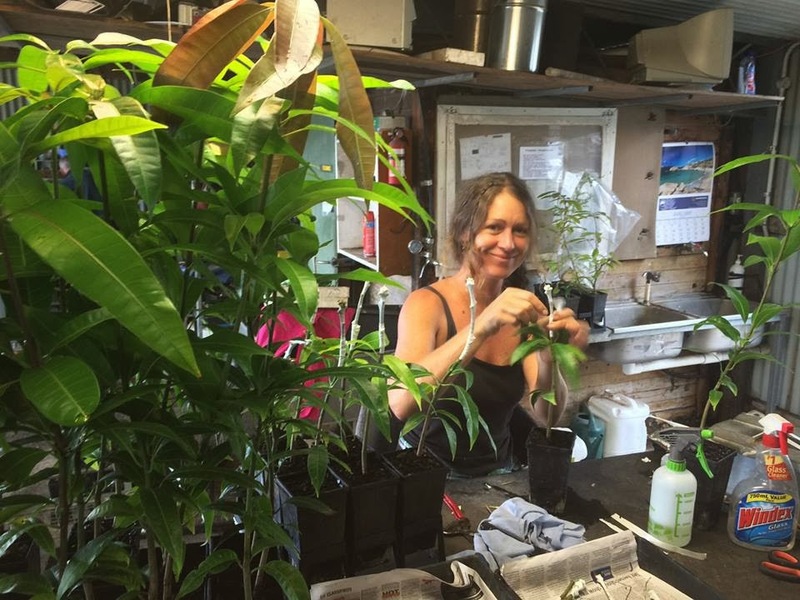 When growing your own you can control some of these problems. Non Astringent persimmons however are practical, easy to transport and can be eaten like an apple and even when hard they still taste good. 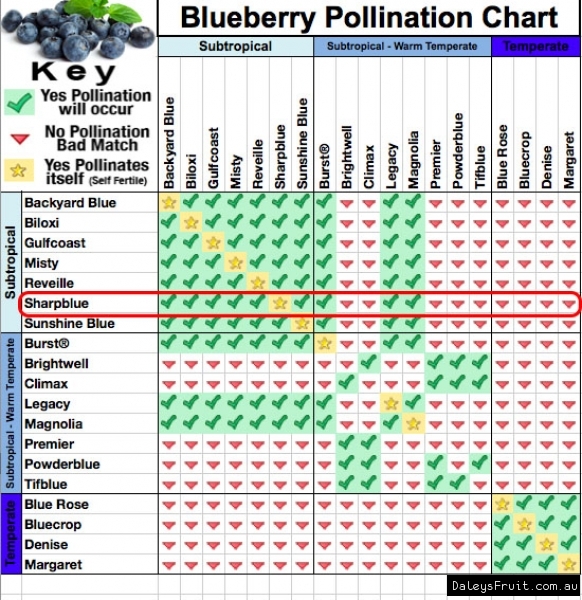 Blueberry Plant Pollination Chart - Which Blueberry variety is right for my climate? How many Blueberries Plants do I need? Answer: 2 or more is going to maximise pollination and give you more berries. Many varieties can pollinate themselves ( See the yellow star in the picture for these varieties ) but a fruit this tasty yet expensive in shops is well worth growing in pots or in the ground and can be very rewarding. 2 or more will give better fruit set just as long as they can pollinate each other or have a green tick in this chart. Which varieties will suit? Are you A) Subtropical, B) Warm Temperate - Subtropical or C) Cool Temperate? After you put yourself in one of these categories use the chart to narrow down the varieties to choose from. For example are you in Sunny Coastal NSW and therefore Subtropical. Then Temperate varieties like Blue Rose or Denise are not for you but Sharpblue and Biloxi are. Do you eat your food too fast? The Monstera nicknamed "Fruit Salad Tree" can help you slow down. It can take 2 weeks just to eat one. It has flavours like pineapple and banana but unlike a banana where the entire banana ripens at once. 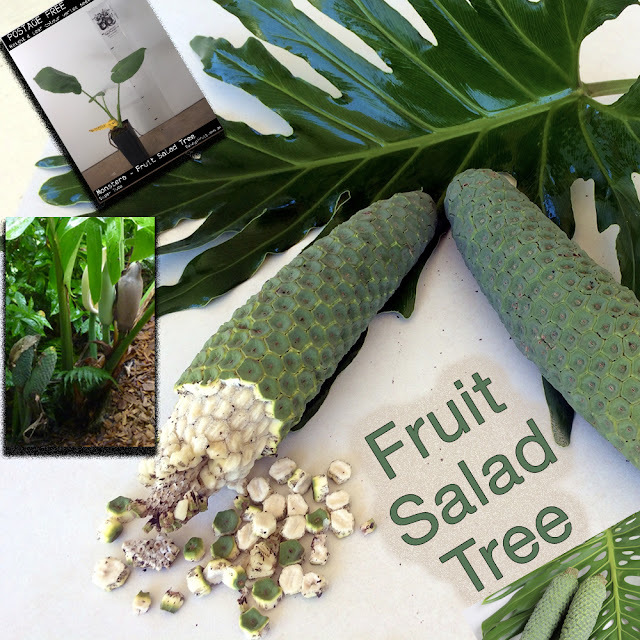 The Monstera will only ripen about 10% of the fruit at a time. You eat 10% (the ripe bits falling off the stem) wrap it back up in newspaper and wait a few more days for your next delicious chance. Meanwhile your whole house will smell beautiful as it ripens. Lots of us have some places in our backyards that don't get full sun and a Monstera will thrive in partial shade. It grows in a wide range of climates one person saying "Who said it was tropical? I live in Hobart and have one outside the front door"